EDINBURGH, Scotland, Sept. 14 -- Scotland, once the bedrock of the British Empire, will decide Thursday if it wants to become an independent nation after more than three centuries of union with the United Kingdom. Rallies on both sides occurred throughout Scotland over the weekend as a flurry of late public opinion polls gave the anti-independence forces, grouped under the umbrella organization Better Together, a slight edge. But analysts on both sides said the vote on the independence referendum is too close to call. 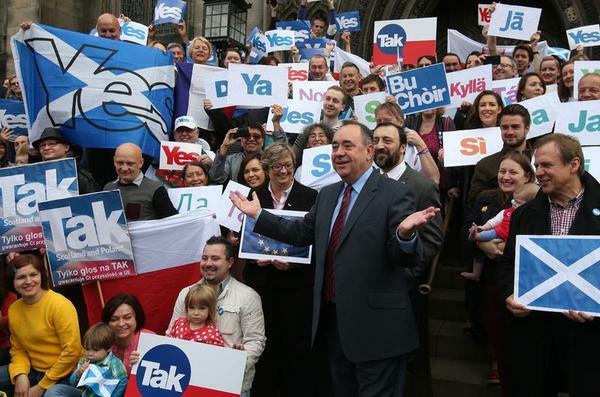 Salmond campaigned in 10 towns and cities at upbeat independence rallies featuring crowds of mostly young people waving the blue-and-white flag of Scotland. Meanwhile, British Prime Minister David Cameron and Ed Miliband, who heads the Labor opposition in the British Parliament, flew north to urge Scots to remain united with England. Cameron said he would be “heartbroken” if Scotland left the British union and also warned that it could negatively affect jobs, pensions and health-care funding on both sides of the border. Four Scottish-based banks added to the economic pressure on the nationalists by announcing they would move their headquarters to London if the independence referendum is approved. In one sense, the nationalists have already won a significant chunk of their original objective of obtaining self-government for Scotland. When support for a “yes” vote surged in the polls a week ago, an alarmed British government in Westminster promised Scotland more self-rule if the referendum is defeated. Osborne’s post is roughly equivalent to the U.S. secretary of the Treasury but with more authority. He is a close ally of Cameron’s, who negotiated the wording and timing of the referendum with Salmond, leader of the Scottish Nationalist Party (SNP) and first minister of Scotland’s Parliament. The day after Osborne’s declaration, former Prime Minister Gordon Brown, a Scot and the Labor Party’s point man in the anti-independence campaign, said that defeat of the referendum would be the “starting point” for giving greater powers to the Scottish Parliament in Holyrood. Brown, who lost the leadership of Britain to Cameron in the 2010 election, is considered influential in Scotland, where the Cameron government and the Conservative Party are highly unpopular. If a majority of Scots vote “yes” on independence, the Cameron government could fall. Cameron, who rules in coalition with the Liberal Democrats, has staked his reputation on defeating the referendum and may face a no-confidence vote if Scotland votes to leave the United Kingdom. Scotland already enjoys a generous amount of self-government, thanks to a referendum in 1997 in which 74 percent of Scots voted for their own Parliament. That referendum was supported by then-popular Tony Blair, who headed the Labor government in Westminster, and a Scottish Parliament was established the following year. But the charismatic Salmond and his well-regarded deputy, Nicola Sturgeon, want more. They dismissed the overtures of Osborne and Brown as a reflection of panic in Westminster at the prospect of the referendum’s passage. The panic was echoed in the London financial markets as the value of the pound tumbled in the wake of latest polls showing the pro-independence side pulling even or slightly ahead. The pound recovered most of its value late in the week. Salmond and Sturgeon contend that Scotland has the financial resources, the technological capabilities and the culture to support an independent nation. The capabilities and culture are not in doubt, but experts differ on an independent Scotland’s economic viability. Scotland would enjoy enormous revenues from North Sea oil that now go into the treasury of the United Kingdom, but the extent of the oil reserves and the costs of extracting oil in deeper waters are in dispute. Future global prices for oil and gas are unpredictable. An independent Scotland would have more assets than just oil revenues, however. The outcome of the referendum may depend more on emotions than on the complicated economic arguments about an independent Scotland’s financial viability. Under Salmond’s passionate leadership, the Scottish nationalists have tapped into a romantic yearning for independence among younger Scots in an election in which anyone 16 and over can vote. Most of the election debate has been waged rationally on economic issues but in recent days has become “all heat and no light,” reports veteran journalist Peter Jones of The Scotsman. Blogs on both sides feature barbed accusations. Salmond has received death threats. Scotland seems on its face to be an unlikely candidate for independence. Its population is only 5.3 million compared to 64.1 million for Great Britain as a whole. It has for three decades been a Labor stronghold, and supportive of an extensive welfare state. But the SNP is even more committed to these policies than Labor, let alone the Cameron government. Unlike Britain, for instance, the Scottish Parliament has maintained free tuition for university students. One out of four Scots works in the public sector compared to one in five in Britain. Judged by European benchmarks, an independent Scotland does not seem unreasonable. Scotland has roughly the same population as Denmark, a successful and respected nation. If an independent Scotland joined the European Union, as it almost certainly would, it would rank 20th in population among the 29 member countries and be more prosperous than all but a half-dozen of them. The call for Scottish independence has deep roots in a land where opposition to English rule goes back six centuries. After the two countries became one in 1707, periodic revolts by Scottish highlanders were brutally repressed. “Culloden,” a book and later a film on the one-sided last battle of the Jacobite rebellion, written by two Englishmen, has been popular in both Scotland and Britain. The book and the movie depict a 1746 battle in which Scottish troops were crushed and entire Highland families massacred by British soldiers and their lowland Scottish allies. Absorbed into Britain, Scots became the engineers, scientists and soldiers of the empire. Many colonial governors-general were Scots, as was the founder of The Economist and the financial leaders who made Glasgow second only to London in business importance during the Industrial Revolution. Scotland’s steel mills and shipyards contributed disproportionally to the British economy; its politics echoed its prosperity, with the Tories commanding majority support well into the middle of the 20th century. But Scotland’s unionized industries were slow to modernize and in the 1980s were outpaced by global competitors. As production declined and unemployment rose, Scotland turned left politically and became a more government-dependent state than Britain. Scots resented those who tried to reduce their government benefits, most notably Margaret Thatcher, whom The Economist said recently had been more helpful “to the nationalist cause than William Wallace and Mel Gibson combined.” Thatcher’s least popular policy, a poll tax, was tried first in Scotland. Still, the Scottish Nationalist Party for a long time barely registered on the political scale. In the 1950s the SNP commanded support of less than 1 percent of Scots. Even during Thatcher’s heyday, voter support for self-government in the form of a Scottish Parliament commanded only a bare majority in a 1979 referendum vote. The margin was so small that Westminster was able to ignore the result until the second and decisive referendum in 1997. Many thought that creation of a Scottish Parliament would fulfill Scottish yearning for self-government and finish off the SNP. But untimely successive deaths of Labor leaders, one by accident and the other by illness, created a vacuum that was filled by Salmond, a onetime oil company executive with a gift for oratory. Much as the Irish patriot Michael Collins argued in the early 20th century that Irish have a different culture and nature than the English, Salmond believes that Scotland has its own “society and nation.” His words resonated with Scots, and the SNP scored an upset victory in 2011 and became the majority party in Holyrood. Despite Salmond’s popularity, the campaign for independence has been uphill for the nationalists. The multi-party “No” campaign has been better financed—including a $1.7 million gift from J.K. Rowling, author of the Harry Potter books—and capably managed by Alistair Darling, a chancellor of the exchequer under Gordon Brown and one of the best and the brightest members of the Blair government. In an early August debate Darling outmaneuvered Salmond. But Salmond rebounded, as he often does, in a second debate broadcast live across the United Kingdom from Glasgow. In a blistering attack on the Tories, he put Darling on the defensive by linking him to the austerity policies of the Cameron government that are anathema to Scotland. Salmond also made an emotional plea to Scots for independence. Better Together has hammed away at the theme that Scotland will be poorer economically under independence. Polls show that this line of attack has been effective, especially among older Scots, who are not convinced that Scotland can make it financially on its own. There is also a complex debate over the currency the new nation would use. Salmond would like, at least for the time being, to keep the British pound. Voter turnout is likely to prove crucial. Some analysts believe there is a latent majority opposing independence, but that Scots supporting the “Yes” side are more likely to vote. The surveys show voters 35 and under favoring independence, and older voters, especially those over 65, opposing it. In the United Kingdom a victory for Scottish nationalists could spur a much smaller but growing independence movement in Wales. Leanne Wood, leader of the Welsh nationalist party Plaid Cymru, has campaigned in Scotland for the nationalist referendum. “If Scotland votes yes, the genie is out of the bottle,” Wood told The New York Times. Whatever the outcome, as Gordon Brown and George Osborne have made clear in their promises to expand the powers of the Scottish Parliament, Scotland is likely to wind up with more self-government than it has now.